26 Oct 1946 to 12 Nov 1946 chartered by Northern Steam Ship Company to carry cargo to Great Barrier, Tauranga, Whangaroa and Napier. 12 Nov 1946 passed to Holm and Company (under charter). 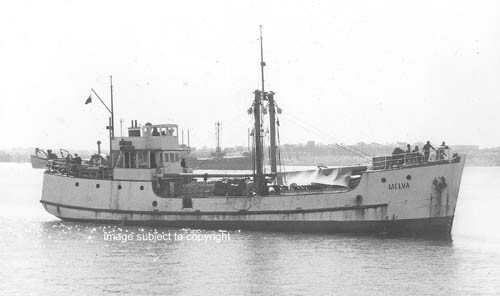 Sep 1948 chartered by Union Manufacturing and Export Co., Petone. Employed salvaging US war material in Pacific. 1949 sold to same company. Damaged off New Guinea and badly holed on reef near Mackay, Queensland. 1951 Sold to Greymouth Shipping Company. In service between Greymouth, Wellington and Wanganui. 1952 new twin diesel engines installed. 1956 Sold to Captain H C Williams, Rarotonga, for trade in the Cook Islands group. 1957 Sold to Dartim Shipping Co. Hong Kong, trading between Timor and Australia. 1961 Arrived Townsville for repairs. Arrested for debt. 2 Sep 1966 Scuttled 50 miles off Townsville.